Search down deep, and we women know that there is a still small voice that urges us to act. As busy as we moms can get, drowning out that voice is not hard to do. In fact, it takes much more time and effort to listen to that still, small voice. The voice that often warms us of bad situations ahead with our kids, otherwise known as mom’s intuition, is there, if we listen closely. Mary was young and not a mom yet when the angel Gabriel came to visit her in Nazareth, according to the story in Luke 1. Verse 29 says she was “greatly troubled at his words and wondered what kind of greeting this might be.” I cannot imagine that feeling of submitting to something, but not knowing how it would end. Well, actually I do- that is what faith is all about. A few years ago, I was serving in Women’s Ministry at my church when the leader told us she was being called to another ministry as chaplain at the cancer hospital. She encouraged two of us to really pray about how God would use us in the future in this ministry. As I prayed over this, I could not get past Luke 1 in my quiet times, particularly when Mary accepted her position for God’s glory. She was not being proud; she was simply recognizing the gift God had given her. It is a privilege to serve for God’s honor! Instead, I would say she humbly accepted God’s favor and submitted to God’s plan. Mary could have doubted that she could ever be mother to the King of the World. She was poor, unmarried, a virgin, young, and a female, obviously not high in the society of the day. How could God ever use her?! Surely, someone more qualified should be considered. Let’s not forget to mention, God did not have to use her; He could accomplish His will through anyone. 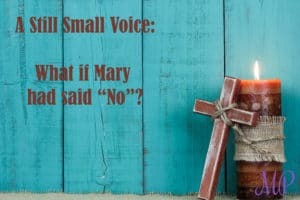 Mary could have denied her role and tried to live the life that she planned. I doubt her disobedience would have went over well. No, instead, she cast aside the doubts and listened to the still, small voice inside her. Because of her obedience and submission to God’s will, the most powerful event in the world took place that still rocks us today: Our Savior was born. Christ’s birth fulfilled God’s promise to Abraham, to be merciful to God’s people. The Hope of the world was born and still lives in us today. God’s will was carried out in the most awe-inspiring way, and HIS Story lives on. Every day, we have the choice to listen to and act upon that still small voice, and live out His Story in our lives.